A clear return and refund policy is a vital part of a healthy consumer-company relationship. Having one that is easy for customers to understand and use will encourage them to continue supporting your business, as well as recommend your brand to their friends and network. Scroll down the page to download or copy and paste our free template, or save even more time by letting our return policy generator do the work for you. What is a Return and Refund Policy? Expand the component below to view the return policy template in its entirety, which you can then copy and paste onto your own site for FREE! Alternatively, you can click the button beneath it to download the policy in Microsoft Word and PDF file formats. All returns must be postmarked within ___ days of the purchase date. All returned items must be in be in new and unused condition, with all original tags and labels attached. Not exactly what you’re looking for? View our other legal policy templates. 2. What is a Return and Refund Policy? Laws for returning and refunding purchased goods are primarily determined by each state, although the Federal Trade Commission (FTC) will step in when necessary to prevent fraud and other illicit forms of business. If a case is brought to the FTC and is found in favor of the consumer, they will help consumers obtain a refund or fair compensation. However, unless something unlawful is occurring, the FTC stays out of the process. There is one exception. The FTC also enforces a “cooling-off rule,” which is a 72-hour window following a “door-to-door” purchase where you can get a full refund. This law gives consumers three days to cancel purchases of $25 or more that were made in a “door-to-door” type transaction, which includes your own home, dormitory, or even your office. This rule isn’t absolute, but for the most part you are able to get refunds back within that 72-hour window if you make a claim with the FTC. The number of days a customer has to notify a company of his or her intention to return an item upon receiving it. The type of refund that the company will give to the customer after the item is returned: including money back, a store credit, a replacement product, or another item of similar value. Where to send the product. Which party pays shipping fees for goods sent by mail. How long it will take to receive a credit or refund. Companies that sell digital products should also list whether they offer refunds on digital purchases, or if they’re only offered in limited cases like when a download link fails to work. Want to save time and ensure your policy is airtight? Visit our refund policy generator, answer a few simple questions, and add the embed code to your website. 1. Place Policies in Plain Sight: Customers shouldn’t have to exert much effort to find the return and refund policy while shopping online. It should be kept easily visible somewhere on your website’s homepage, possibly even on the site banner. Furthermore, this information should be included in confirmation emails sent immediately after a customer has purchased an item. Some companies might be concerned that this level of transparency will hurt their profit margins. On the contrary, research suggests that this approach actually increases sales and decreases returns because it builds trust with customers. Unhappy reviewers spreading negativity online can be much more detrimental to your business than simply dealing with a few extra refunds. 2. Don’t Copy & Paste Disclaimers: Avoid copying and pasting parts of other return and refund policies from the web — these weren’t constructed with your business in mind. Instead, take into account your company’s size, the products it sells, and how customers use those products to customize your own. By using such details, a policy can be personalized and molded to best fit the needs of its consumers. Use a light tone: many successful companies craft their refund policies in a serious but entertaining voice to make sure that customers read them. Some even include testimonials from customers, which helps build trust. 3. Write in Layman’s Terms: Try to minimize legal jargon and complex words, because they may confuse customers. Clear and simple wording ensures that customers follow proper procedures when returning products, thus reducing the amount of time needed to process them. 4. Avoid Frightening Customers: Steer clear of phrases like “must,” “required,” and “we are not responsible for,” to prevent scaring people off. Return policies shouldn’t be deceptive just to achieve friendliness, but they shouldn’t use aggressive language either. You can save time and money by encouraging customers to arrange things themselves with your easy-to-use policy. 5. Ensure that Item Descriptions are Accurate: Customers should be explicitly told the intended function of a product before they reach the checkout counter. This is particularly important for ecommerce companies, where the consumer doesn’t have a chance to physically interact with a product before paying for it. Some companies use sound clips or videos to more clearly depict their policy to consumers. 6. Write Specific Instructions: The more specific the policy is, the less likely that customers will be uncertain about what to do. By outlining this important information clearly, your company will save money in the long run. Once a policy is in place, it’s important to tweak it when necessary to meet the needs of your business and those of your consumers. Here are some ways to keep things running smoothly after you’ve implemented yours. 1. Notify Customers of Changes: When any changes are made to pre-existing policies, it’s important to let customers know. Additionally, it’s good business practice to respect old ones if a customer made a purchase before the change. 2. Let Customers Know What to Expect: If your company offers exchanges or credit, it should be made clear that these are options. By clearly stating specific rules and guidelines, the entire process is made easier for both sides. 3. Make Sure Your Staff is Informed: Having employees well-versed in company policies helps keep the customer service process running smoothly. By being able to confidently answer these questions, staff members can move from one case to the next with greater ease. To make matters easier, companies should also strive to keep customers informed about how everything is proceeding. 4. Offer Alternatives to Traditional Refunds: Returns do not always need to result in a full cash refund. Offering alternatives is an excellent way for your company to both exercise cost efficient practices, and to make sure that customers remain happy. Some companies choose to offer store credit because this ensures that money remains with the store. Keep in mind that not everybody wants money back when seeking a refund — they may just want fair compensation. If they are able to find a nice alternative to their exchanged product, customers will not only be satisfied but may recommend your business to others as a place that treats customers well. 5. Provide Customers with a Reasonable Amount of Time: Some companies have strict return and refund policy periods to prevent exploitation. In many cases, however, allowing only a short window of time is not beneficial. Customers feel more comfortable shopping when they know that goods can be swapped or taken back if necessary. Just make sure to keep the return period finite to avoid abuse. Having a reasonable return period is essential during the holidays. A tight timeframe for taking back goods scares off many customers, because they know that it might be necessary to do so. 6. Don’t Attach Hidden Fees: Returning a purchase is a lot less fun than making one. When customers proceed with the process, avoid charging unexpected shipping or restocking fees. Just as the disclaimer on your website should be transparent, make it a point to keep all return fees obvious. Otherwise, you’ll be constantly dealing with angry customers (which is no fun, plus a drain on resources). 7. When Mistakes Occur, be Honest: If your company makes a mistake with a return or refund, the best approach is to be honest and quickly remedy the situation. A reasonable customer understands that everyone makes mistakes. How these mistakes are remedied is what is important. A thought-out, customized return and refund policy when paired with fair business practices can protect both customers and businesses. Be aware of how it’s is used and pay attention to consumer feedback in case revisions are needed — it’s a living document, and should be revised and optimized over time. Every company has particular rules set in place to protect themselves as well as their customers. Here is a look at how some famous companies (ecommerce and others) have molded their return and refund policies to best suit their businesses and the people they serve. Purchases made at a Lowe’s retail store or online can be taken to any U.S. store within 90 days, and either repaired, replaced or refunded. Their refund policy is customer-friendly, and gives you a variety of ways to get your money back even without a receipt. For instance, if you gave them your phone number at checkout when you purchased the item, that information is enough to facilitate a refund. However, Lowe’s has a strict winter holiday refund policy, where they don’t allow returns on seasonal items after January 1st. This contrasts with many retail stores, which relax things a bit in the weeks following Christmas to appease unhappy gift recipients. Lowe’s also makes it explicitly clear that original shipping charges on a purchase are not refundable — likely because they’ve encountered problems with this in the past. Finally, to highlight federal laws, Lowe’s uses bold stop-sign icons. These stand out on the page, and help draw the reader’s attention to details deemed important by the company and the federal government. Overall, their return policy is a good example of what to include in one, and how to direct consumers toward key information. Everything at Victoria’s Secret, regardless if purchased online or at a retailer, is returnable (as long as the sewn-in tag remains on the clothing). This is a great policy for shoppers, because it allows them to buy stuff without fear of being unable to take it back. It also helps drive sales. However, Victoria’s Secret still protects itself. Within 90 days, exchanges and refunds are acceptable, but after 90 days it changes to exchanges & credit only — thus keeping money in the store. They also only allow a maximum of 7 returns within a 90 day period. This stops large-scale refund schemes, while also allowing flexibility to loyal customers. Thanks to an efficient design and useful links to related topics, their policy page is also very helpful and easy to navigate. Best Buy has a very user-friendly returns and exchanges page. This is critical for such a big company, because it alleviates some of the strain on customer service representatives. They even manage to make a push for their Elite & Elite Plus Membership programs in their policy — illustrating how members are granted greater flexibility than normal customers. Best Buy also makes the entire process simple for users. Online goods can be returned at any retail store, via mail by your preferred carrier, or even by using their prepaid label. As a mega-corporation with a diverse clientele, it makes sense for Walmart to include instructions for finding their return policy in Spanish on their website. It also makes sense that there is an extensive amount of information included here, since they made the decision to organize the whole gamut of company policies in one place. Another thing that stands out is Walmart’s holiday extension policy. Any goods purchased between November 1st and December 24th are subject to the 15-day return period beginning on December 26th rather than the actual date of purchase. This degree of flexibility encourages people to purchase Christmas & other seasonal gifts here, and helps bolster sales at Walmarts across the country. They also have a specific policy for tobacco and alcohol — making such goods only returnable with the receipt to the original store they were bought at originally. Walmart is famous for having low prices, and this is done to prevent abusers from taking advantage of the system. Amazon allows returns within 30 days of purchase to be fully refunded (if they are new & unopened). 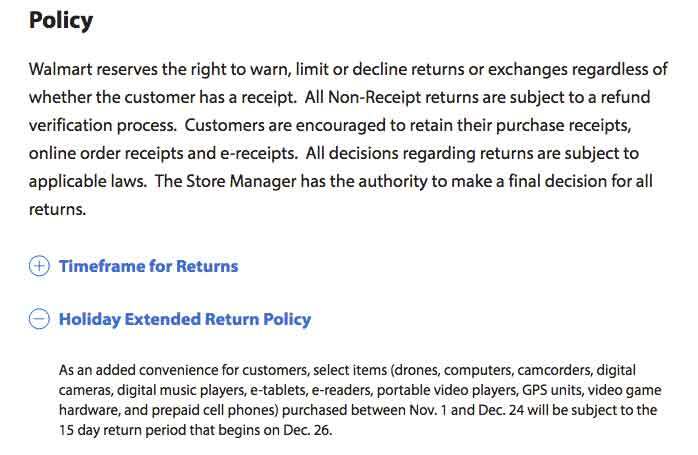 Also, similar to Walmart, they have a winter holiday policy — allowing goods purchased between November 1st and December 31st to be sent back up until January 31st. One of Amazon’s most interesting features is that they allow consumers to trade used products for Amazon store credit. They don’t even need to be goods purchased on Amazon’s website. As one of the top dogs in the internet marketplace, it’s not surprising to see such an innovative idea. Macy’s takes the customer-friendly attitude up a level, and allows many goods to be returned up to a year after purchase (there are, of course, certain restrictions on this). All you need is the receipt, return label, or the packing slip. Even if you have no proof of purchase, it’s possible to get store credit — calculating the amount from the item’s lowest price point within the last 180 days. Macy’s also has specific policies based on the products you buy. For instance, mattresses have their own, as do cosmetics — even certain brands too (Louis Vuitton being one of the most notable cases). However, Target’s own brand items can be brought back within one year with a receipt. Plus, holders of a Target REDcard™ are given even greater flexibility. Using a policy to encourage customers to sign up for credit cards or specific programs is not a new strategy, but it is still an effective one. They also have a clear-cut rule regarding buy one, get one free (BOGO) purchases. Target’s frequent use of BOGO as a sales tactic likely inspired the need to mention this on their website. Allowing refunds when necessary is a part of good customer service, but there are still companies that don’t allow it in certain situations. A famous example of this is Apple and their iTunes platform, where they’ve deemed such digital products to be of a non-refundable nature for customers within the U.S.
One of the reasons Apple and other companies have had to take such a stance is because of the potential for abuse. Serial refunders take advantage of honest businesses with flexible money-back policies, so it shouldn’t be surprising that there’s pushback. There are some advantages to not offering refunds. In some cases, it demonstrates to customers that a company is confident in the products it sells, thus enhancing their image in the eyes of the public. Additionally, not offering refunds creates an air of exclusivity, which can be particularly attractive to certain customers. While not suitable for every business, some companies are better off not providing refunds to their customers. If this is the route you decide to go, make sure it’s explicitly stated on your website or you could encounter legal problems down the road.